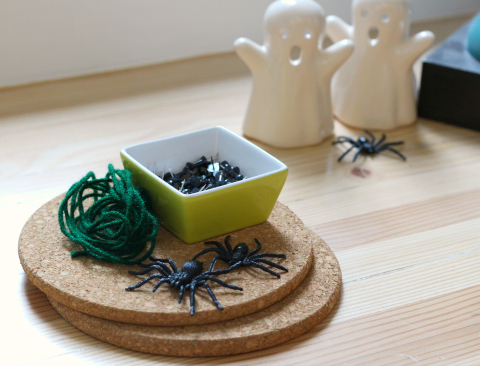 This spider web craft is not only an adorable addition to your Halloween craft display ( am I the only one with a mantel full of kid made stuff? ) 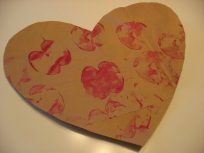 it is also a wonderful activity that develops the pincer grasp , a major part of fine motor skills. 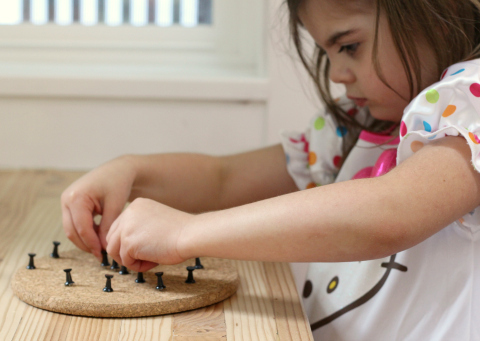 By pushing those thumbtacks in, pulling them out, and repositioning them your child will be developing these skills. Wrapping the yarn takes major concentration and I am glad it did. I would watch frustration levels and be there to offer help if needed but my ” I will do it with NONE of your help Mama” 4 year old managed even if she went at it a different way than I would have. 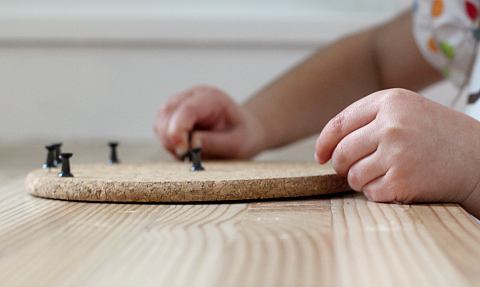 Test our your cork to make sure the thumbtacks are nice and snug and please only use these tacks with children who are absolutely not going to put them in their mouths. They can be very dangerous if swallowed. Always be in arms reach and carefully watching. Gather your materials. 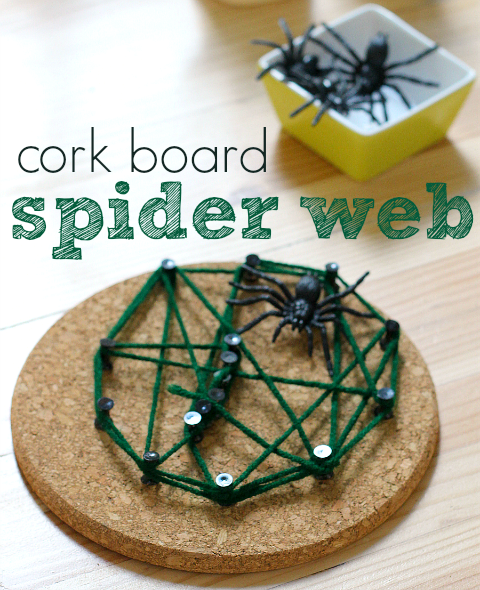 You will need a cork hot plate ( from IKEA), some thumbtacks, yarn, and a plastic spider. 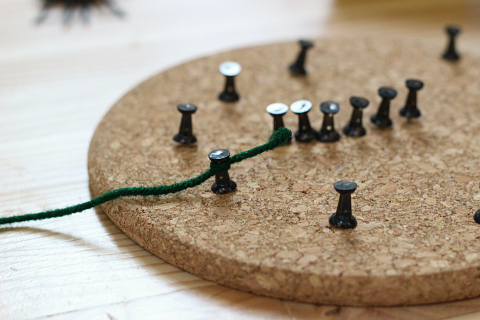 Start by pushing in the thumbtacks. 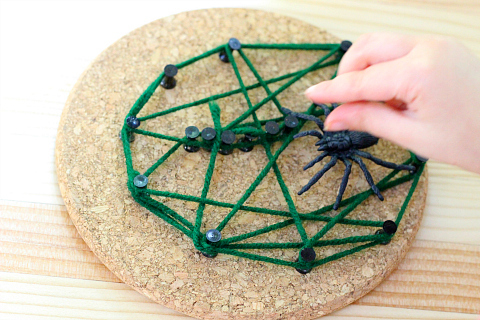 When I explained the idea to my daughter I said the spider needs a web and that the tacks will make the edges of the web, the yarn will be the threads. She went to town adding tacks. Next cut a length of yarn long enough to make a good web, but short enough for a child to handle. Tie it onto a tack. Wrap! When she started wrapping it was all loosey goosey and I interfered. I didn’t want it to frustrate her when it was all slack. I shouldn’t have stepped in because she had a plan and really it’s NOT my web. I was the only thing frustrating her. Luckily she is almost as subtle about her feelings as I am and told me in no uncertain terms to back off. I did. It’s hard sometimes not to jump in and I find it’s way way easier not to when it’s your students than when it’s your own kid. I know this lesson will pop up in all sorts of arenas over the next dozen or so years. Back off. Got it… I hope. It took her a minute ( and I stayed quiet letting her be) but she got the hang of wrapping, of how she had to hold the cork still, and wrap the yarn, pulling it tight. When the web is complete it’s time to add the spider. 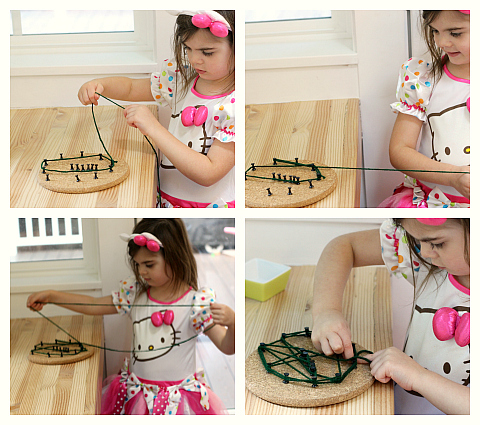 Love your “spin” on geoboard play!